I had the pleasure of teaching two workshops on Wednesday for some amazingly talented children. 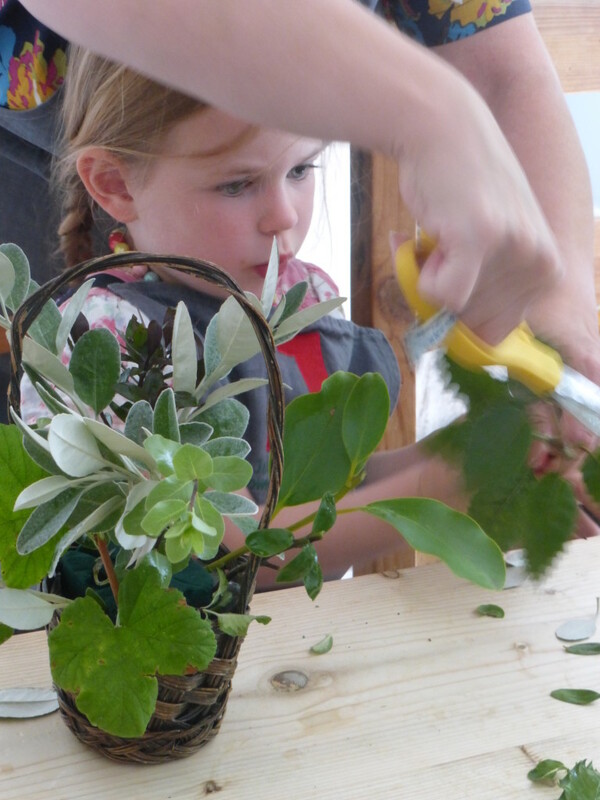 The first was organised as part of a range of holiday club activities and the second took place at Julie Davies flower workshops HQ. 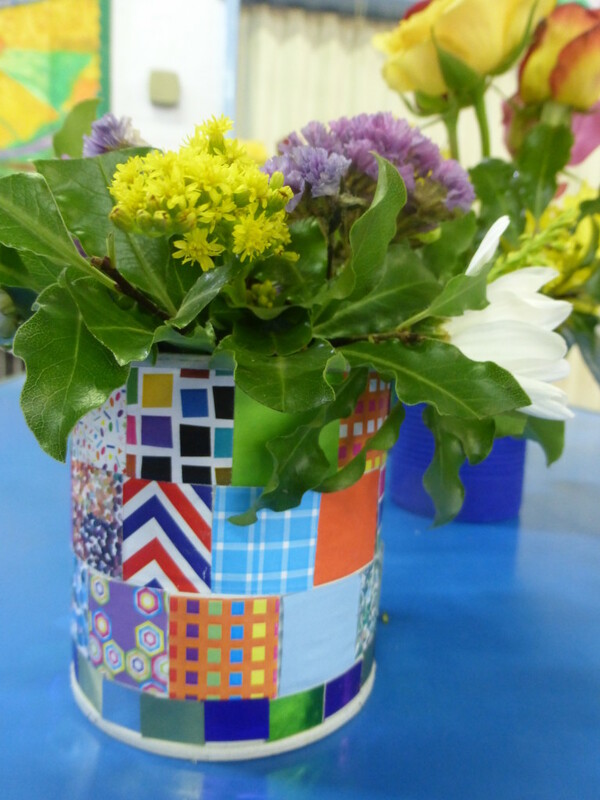 At the morning workshop we made arrangements in recycled tin cans, which the children had decorated before I arrived. A lick of acrylic paint and then cut-outs and gems were artfully arranged and glued in place. 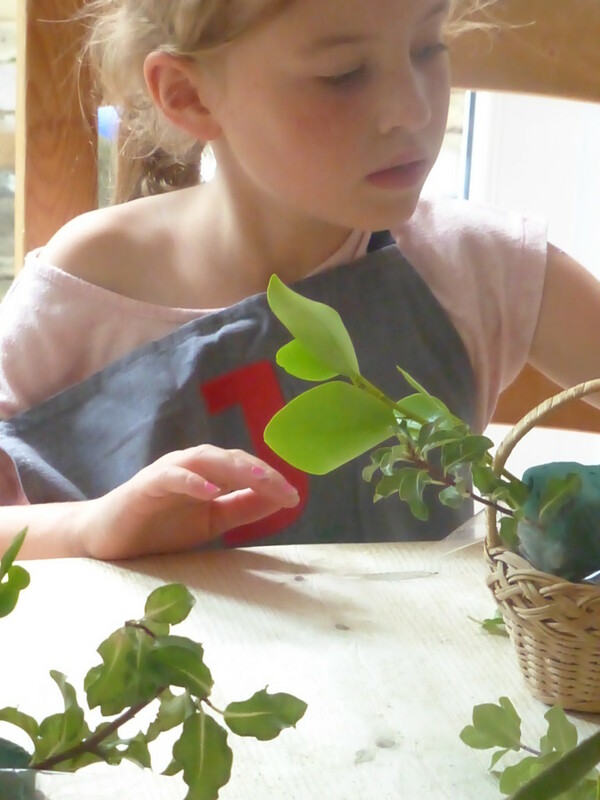 The children divided into two teams of eight and, with a bucket between them, scoured the grounds looking for suitable foliage for their arrangements. We resisted picking the blackberries we came across, deciding that they would be too prickly to handle! This particular arrangement caught my eye, but the other 15 were equally as stunning. After a quick lunch, I set up a “pop up” workshop in my kitchen and got ready for another six children to join me for the second workshop of the day. A happy band of mini-me’s, ranging in age from three to seven-and-a-half. This time we made arrangements in baskets and had great fun estimating how long it would take everyone’s floral foam to sink into the bucket of water. 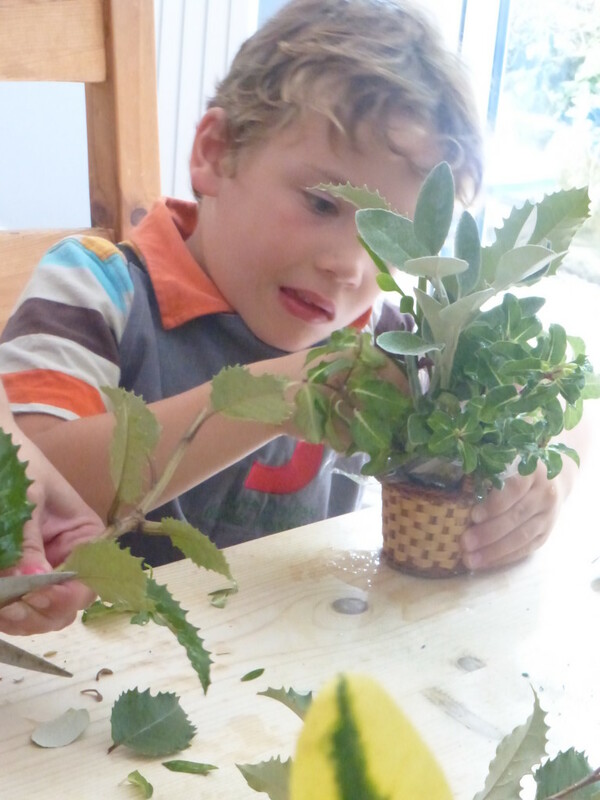 With a couple of Mums on hand to supervise the cutting of foliage we added greenery to our arrangements first. After that came some lovely pink roses, alstromeria and some pale green spray carnations. The finishing touch was a huge bow on each arrangement. 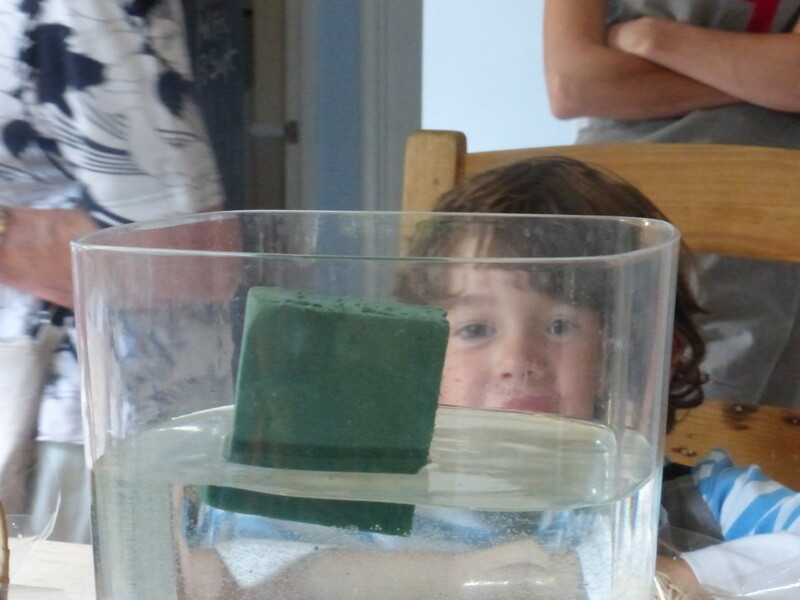 I think everyone really enjoyed tearing the ribbon into strips and making a fish-shape with the widest piece. Sadly no one brought a third hand with them, so once again, the Mums stepped in to help with the final tying off. This technique is a great way of faking a tied bow – if you want a more detailed explanation of how to do it, please do leave a comment for me below. After a mammoth hand washing session – you’d be amazed how many children you can fit into a small cloakroom, we snacked on squash and fresh fruit. 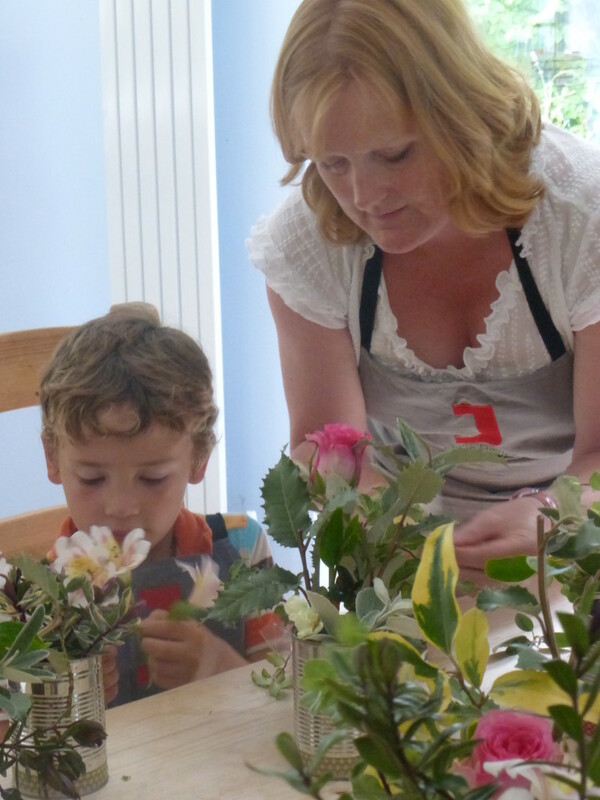 If you’d like to find out about my forthcoming workshops you can sign up to my mailing list direct from my website. Very well done everyone and big thank you to Julie. Victoria had a great time and could not wait to show me how to make the special bow. 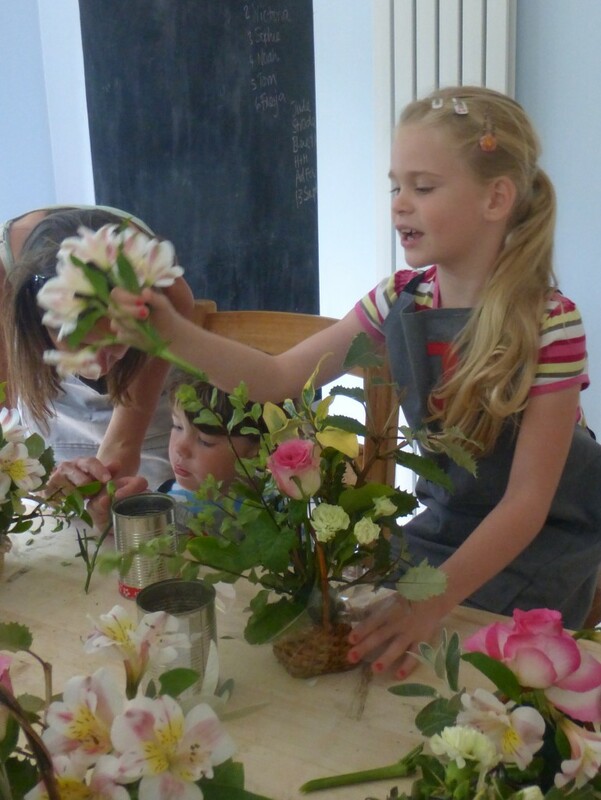 She now wants to take up flower arranging on a regular basis. She absolutely loved it!